President Trump did not give a timetable for the planned military exit from Syria. Last month, he surprised the world by announcing that he was pulling back American troops from Syria, resulting in the resignation of Defense Secretary James Mattis in protest. Trump argues that there is no need for the US troops in Syria as they have accomplished their primary job of defeating the ISIS. "I never said I'm getting out tomorrow. I said we are pulling our soldiers out and they will be pulled back and Syria and we are getting out of Syria. Yes, absolutely. But we are getting out very powerfully," Trump told reporters during a Cabinet meeting at the White House on Wednesday. "I don't know somebody said four months but I didn't say that either. I'm getting out, we are getting out of Syria," he said when asked about the timetable for the exit. "Syria was lost long ago, it was lost long ago. And besides that we're talking about sand and death, that's what we're talking about. We are not talking about vast wealth. We are talking about sand and death," he said. The US has some 2,000 troops in Syria, which will gradually return from this war-ravaged country. Earlier, on his first visit to US troops stationed in Iraq, Trump defended his decision to pull American troops out of war-torn Syria, saying the US cannot be the "world's policeman". "We don't want Syria, Obama gave up Syria years ago when he didn't violate the red line. I did when I shot 59 missiles in but that was a long time later and when President Obama decided not to violate his statement that never crossed the red line and then they did and he didn't do anything about it," he said. Trump said he will protect the US-backed Kurdish fighters. "Now the Kurds it's very interesting Turkey doesn't like them, other people do. I didn't like the fact that they are selling the small oil that they do have to Iran and we asked them not to sell it to Iran but the Kurds, our partners, are selling oil to Iran. We are not thrilled about that, I'm not happy about it at all," he said. "At the same time, they fight better when we fight with them. You know when we send 30 F-18's in front of them they fight much better than they do when we don't and you've seen what's happened. But we want to protect the Kurds nevertheless we want to protect the Kurds but I don't want to be in Syria forever. It's sand and it's death," the US president said. 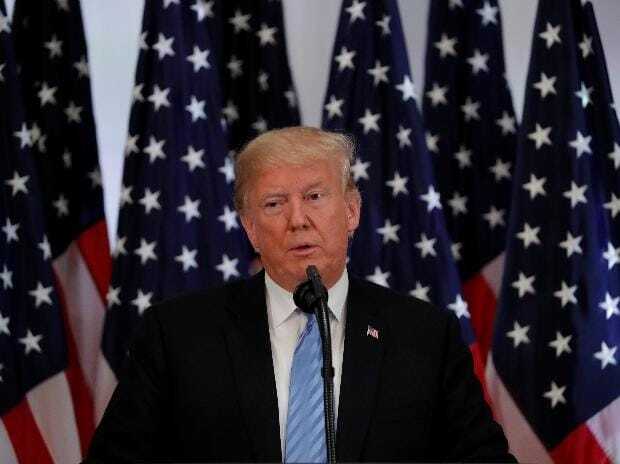 Trump has criticised previous administrations for sending and keeping US troops abroad, and has made bringing troops home part of his signature "America First" policy as he eyes a re-election bid in 2020. "When we kill ISIS - if we don't, know everyone says then they'll come to our country. Well, that's possibly true a very small percentage but you know where else they are going? To Iran who hates ISIS more than we do. They are going to Russia who hates ISIS more than we do," he noted. "We are killing and then I read when we pull out Russia's thrilled. Russia is not happy. You know why they're not happy? Because they like it when we're killing ISIS because we are killing them for them and we are killing them for Assad and we are killing ISIS also for Iran," he said. Trump told his Cabinet colleagues that Syria was in a mess when he took over. "When I took over Syria, Syria was a mess. It was riddled riddled with ISIS. And now everybody says it's down to 1 per cent of the land and sometimes you could even see a less 1 per cent," he said. "That place was a mess, it was terrible. But we also have to have other countries fighting ISIS. You know, we're helping by doing this. People say Russia and Iran, we are helping them. Everything we do over there helps them. They don't see us leave because we are knocking out ISIS. Let them fight ISIS too. We're spending all of this money. I want to spend money in our country but we've had a tremendous success in Syria," Trump said.